School facilities present a set of unique security concerns. Given the vast amount of daily activity on school campuses as well as the large footprint of most facilities, video surveillance has been an important and integral component of school security for decades. In recent years, technology has advanced and become more effective and efficient, so it is becoming necessary for many facilities to consider upgrading their security systems to integrate modern enhancements. Learn more in today’s blog. The existing analog video surveillance systems that currently exists in many schools provides a valuable framework that can be upgraded over time in order to avoid prohibitive start-up costs. For example, DVRs can be transitioned to IP-based VMS models which provides a strong basis for a more modern framework and then cameras can be upgraded as time and money allow. Most schools are equipped with lockdown systems, intrusion alarms, and/or other existing security systems that can be integrated with newer video surveillance technology to maximize the efficiency of the system. By integrating your existing intrusion alert system with video surveillance, images and video can be captured in real-time once an alarm has been initiated, allowing the security manager to identify why the system was triggered in the first place. Large school districts must concern themselves with centralized management of their video surveillance data in order to ensure that faulty cameras do not go unnoticed. A centralized management system will also streamline updates and maintenance, lessening the workload as the system expands. 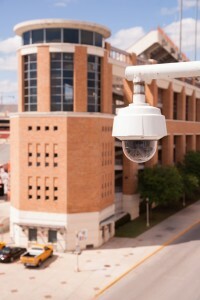 By providing access to a school’s video surveillance feed with 3rd parties, on-campus security can be greatly enhanced. It is becoming more and more common for schools to allow fire departments, police, and other municipal authorities to access their surveillance feeds, which allows first responders to understand the situation on the ground and react accordingly.This helps to ensure an accurate assessment of the threat level at hand and an appropriate and efficient response. This entry was posted on Thursday, April 14th, 2016 at 12:46 pm. Both comments and pings are currently closed.